Born : October 21, 1925 (for some sources : 1924 or 1929) in Havana, Cuba. Died : July 16, 2003 in Fort Lee, New Jersey. 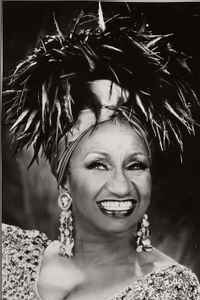 The voice, charisma and talent of Celia Cruz have created one of the most impressive careers in all of music. Merely listing her accomplishments would require a book. Her more than 70 albums have yielded an unending harvest of gold and platinum records, and she has received more than a hundred awards from prestigious institutions around the world. She received the first of her five Grammy Awards in 1989, and also won two Latin Grammy Awards. She received three doctorates Honoris Causa from Yale, Florida International University and Miami University. Also appearing in 10 movies, most recently including "The Mambo Kings" and "The Perez Family". Celia Cruz began singing in amateur contests at the age of 14, in her home city of Havana, Cuba. She studied music theory, piano and voice at the National Music Conservatory. In 1950 she began singing with the conjunto La Sonora Matancera, and with that group she was a central figure in some of the most glorious chapters of Afro-Cuban music, recording a number of legendary songs, including "Yembe Laroco", "Yerbero Moderno", "Burundanga", and "Caramelo" by the end of the 1950's La Sonora Matancera was the most popular group in Cuba. Celia's alliance with them took her beyond the coast of Cuba and exported her talent to the world. While in the group she met Pedro Knight, at the time one of the band's two trumpeters. This relationship culminated in matrimony and lasted 42 years.